This is a rendition of The Stretch, overlooking the Top of the Stretch at Saratoga Race Course. It marks the first significant enhancement to the grandstand structure since the mid-1960s. A new fan experience area will debut in July at Saratoga Race Course. The new area is called The Stretch and marks the first significant enhancement to the structure since the mid-1960s. The Stretch is an all-new private hospitality area featuring “modern and upscale amenities in a casual environment with breathtaking views of thoroughbreds rounding the final turn as they enter the dramatic stretch run,” NYRA said in a news release. Reserved seating options for The Stretch are available for paid reservation on a seasonal basis. Officials said inventory is limited and expected to sell quickly. Reservations can be made through the NYRA Box Office by phone at (844) NYRA-TIX, via email at boxoffice@nyrainc.com or at www.nyra.com/saratoga. Since 2013, NYRA has invested more than $30 million at the historic venue in efforts continuously designed to enhance the guest experience and provide amenities that are consistent with those available at first-class stadiums and arenas. In 2018, the grandstand will also be outfitted with a new copper roof which will offer protection from the elements and improve the experience for guests. The Stretch will offer a total of 32 new modern boxes, each offering unique configurations accommodating parties ranging from four to 12 guests, in comparison to traditional clubhouse boxes which each seat five guests. The options include tiered boxes, which each feature a halfmoon table and total of eight seats split evenly on two levels. The lounge boxes offer couch-style seating. The flex boxes contain three tables which each seat up to four people, and can be configured to host four, eight or 12 guests. The upscale circular bar, featuring a full range of beverage options, is raised to offer uninterrupted views of the Top of the Stretch. The bar will be bordered by a drink rail facing the main track with a total of 20 raised seats. Additionally, a two-tiered dining area alongside the bar will feature four, six and eight-person tables. The front section of The Stretch will contain approximately 200 premium reserved seats, which are each flanked by a table. 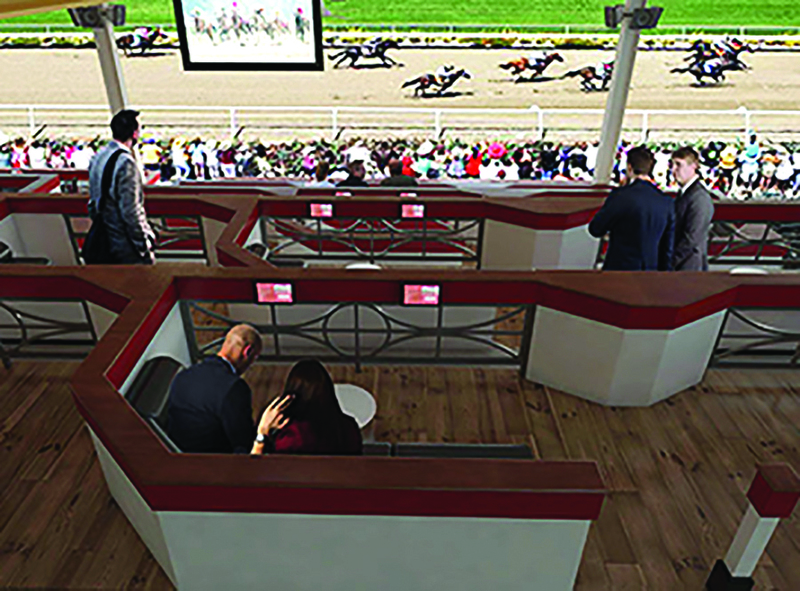 The boxes, reserved bar seats, and dining tables will feature touchscreen tablets offering access to livestreaming, mobile wagering via NYRA Bets, and mobile food and beverage ordering. All hospitality at The Stretch will first be available to the general public on a seasonal basis. Remaining inventory will be available for partial ticket plans beginning in April (based on availability). The 2018 40-day meet, which includes 69 stakes worth $18.8 million in purses, will run from Friday, July 20, through Labor Day, Monday, Sept. 3. For more information about Saratoga Race Course, visit www.NYRA.com/Saratoga.